In late 2015 my youngest kidling started school, and, for the first time in a LONG while, I found myself with some time to spare. Hoping to get back into quilting, I started looking for fabric stores in my area. I stumbled upon FabMo, and went to check it out. Instead of the quilting-cottons I thought I will find, I discovered piles of smallish, exquisitely-beautiful and TEXTURED designer upholstery textile pieces. All of these fabrics, I learned, were rescued from the Design Center in San Francisco. I returned home with a small pile of these luxurious, great-feeling and hard-to-come-by samples. Little did I know that this modest pile will soon take me on a creative adventure that will change my life! These upholstery textiles brought together many of the interests I pursued throughout the years, as well as many of the things I cared about. They were beautiful, for one. They had nice colors, pleasing designs, and irresistible textures. Each of them was a piece of art all on its own, created by teams of dedicated, yet unknown to me, textile designers and fabric technicians. They were also orphaned. Swatches of fabric that were used as furniture-showroom samples, and were rescued en route to being discarded. They brought with them the air of an unknown past and a life lived, as well as the desperation of an imminent dire future. Their allure was seductive. I started collecting these samples because they were gorgeous, and because I could not stand the thought of letting them go to waste. I became obsessed with giving them a second chance, a new life as items both aesthetically pleasing and useful. At first I sewed bags, but soon began turning them into any product I could think of. Once I started sewing, I just couldn’t stop! I am an artist working with fabrics. As such, I focus my designs on the basic visual elements of art: color, texture, pattern and shape. I prefer strong colors in in-between hues, such as purples, magentas, maroons, mustards and turquoises. There are rarely pure primary colors in my work, and hardly ever browns or pure whites. I like colorful clothes and surrounding myself with colorful objects. Color deprivation is painful to me. Thus, in my work I enjoy using brilliant colors, which I incorporate into everyday life. I believe that colors can affect your mood, and that vivid colors can lift your spirit. Through my work I try to create happiness. Patterns and shapes are an integral part of my source material, and I use them to my advantage. I enhance them or diminish from them as I see fit. I enjoy combining, harmonizing, contrasting and otherwise playing with different fabrics, in ways that use the existing to create something new and surprising. Textures stimulate the eye and excite the mind. I find juxtaposing different textures to be especially thrilling, and try to do so as much as possible. Hence the “Texture” part in ANY Texture. As a textile artist, I am also concerned with how my work feels to the touch. I use only textiles that feel good. I avoid anything scratchy, rough or artificial-feeling. My work is meant to be touched, even if it is hanging on a wall. I have always found beauty in the most unlikely places: peeling paint on a wall, layers of old paper on a billboard, rusting structures, and old, used, or discarded items. Throughout my life I looked for this beauty and tried to shine light on it, be it through art, photography, or academic research. A historian by training, I value the past of the materials with which I work. I respect their birth as other people’s creations, and, by turning them into something new, pay a homage to those who made them. Likewise, I recognize each piece’s individual journey through our world, and appreciate it’s unique story. I find great depth and beauty in this past, whether I know it or not. Environmental sustainability is also very important to me. In my daily life I routinely conserve, recycle and compost. Preventing useful items from going to the landfill has always been a strong motivation in my work. In this I am privileged to be following a long line of artists, starting with Dada Movement artists such as Kurt Schwitters, who have been breathing new life into discarded objects. I not only repurpose, upcycle, and reuse fabrics, but also try to pursue a zero-waste policy in my studio. I regularly attempt to find use even for the smallest scrap. This is my modest contribution to the wellness of our planet. I try to help save our world, one piece of fabric at a time. To me, making art is not only about the design, but also about the process. I enjoy feeling things with my hands, so touching and manipulating fabrics brings me great pleasure. 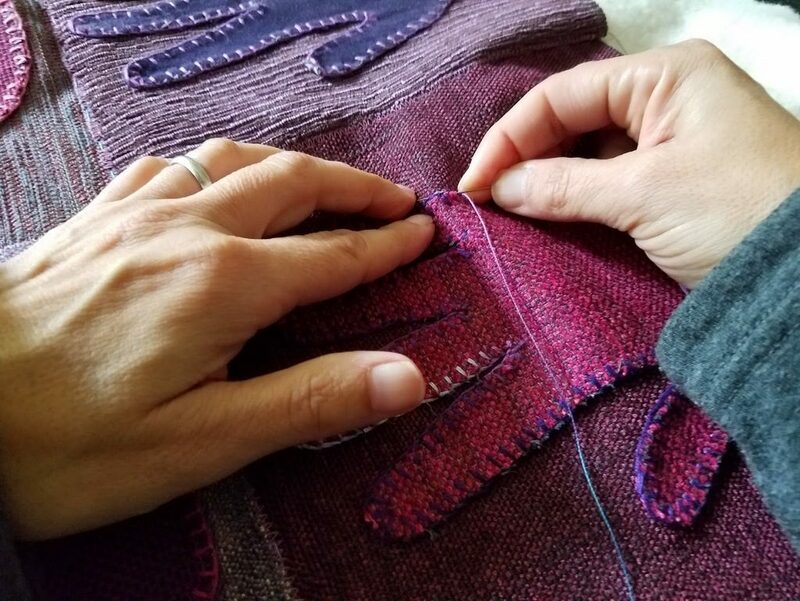 I relish slow, careful craftsmanship, and value the intimate connection between maker and creation. Everything I make is truly handmade, and I do my best to craft it well.